Data Collection – To determine whether land has strong, consistent wind, Eurus constructs several meteorological towers throughout the potential project area to collect and analyze wind data for at least one year. If the land does in fact have good wind, and there is also sufficient access to high-voltage transmission lines with the capacity to handle additional power generation, Eurus may begin the planning and construction of a wind project. Land and Construction – To reduce negative effects of construction on the land, Eurus first conducts environmental impact assessments to minimize wildlife habitat destruction. Eurus also consults with and compensates landowners for any crops or land damaged during the construction process. The complete construction process includes the building of access roads to be used by construction vehicles setting up the wind turbines, the construction of wind turbines and the building of substations and a small operations building as necessary. Operation and Maintenance – Once construction is complete, a team of permanent staff hired by Eurus operates and manages the wind project. This operations team repairs and performs routine maintenance on the wind turbines. Eurus also maintains any access roads built for the project after construction is complete. Dismantle or Repower – When the project reaches the end of its lifetime, generally after about 25 years, the turbines may be removed and Eurus will restore the land to its original state (or better) than when the project began. 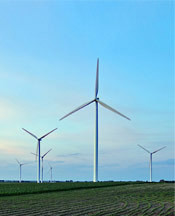 Alternatively, the windfarm may be repowered with newer turbines using more advanced technology.